ial automatic self-correcting and localizer and creasing device, continuous collecting and ordering device.The machine is adopted with touch screen,PLC operation system,(online long-distance system is optional)and remote controlling system,transmission configuration adopts gear box which is durable,equipped with high power servo motor to complete 4, 6 corners back lock function, achieve stable, high effect, more humanity result. Equipped with ten wind suction belts with a width of <?XML:NAMESPACE PREFIX = ST1 />102mm; 10mm metal plate set the width by moving laterally,and embossing power idler pulley guides the paper output belt; setting baffles on both sides, and adjusting them back and forth as per the product style; equipped with two paper output blades which can be adjusted the anisomerous length according to the finished product; equipped with wind suction device and servo motor make it easy and prompt to operate and ensure accurate, automatic & serial feeding. Feeding partcan fold 400MM height paper, pneumatic upper feeding pressure to ensure stable and smooth paper-delivery, operators can control paper-feeding switch at any operational areas. Equipped with back cone paper side mark positioning system. it will adjust the paperboard when the paperboard oblique, equipped with two sets press-wheels creasing devices.The creasing device is used to crease again when flexo printing die cut creasing result is not good, it make paperboards stay stable during folding, it’s fast and easy to adjust paper size. Three-board type structure, upper belt is main transmission, which ensure stable and smooth paper delivery. all paste tubes can be loaded and discharged; there are two paste tubes on each end with large capacity, they are chosen according to the actual situation; the paste volume in the tubes is adjustable, stable and easy to maintain; the thickness of the provided paste wheel is 5mm -8mm , and they can be customized according to special requirements; the paste tubes adopt sturdy, durable all-copper materials; the bottom folding consists of four bottom gluing equipments. Three-board type structure, upper belt is main transmission, which ensure stable and smooth paper delivery Equipped with two highpower servo motor to perform the functions of anti-hook the 4-6 corner boxes. One Imported glue spraying machine (America Valco two photoelectric three guns), cold glue. Hard-driving controller and interface adjustment can control servo motorfast and easy to a-djust the parameter. Photoelectric inspector can be installed on a fixed place, no need to move it, only need to enter parameter into touch interface, back anti-hook speed can be tracked by encoder inspector to ensure ac-curacy speed-testing. independent drive and the speed is adjustable. Adopts imported belts which are independent upper and lower main transmission and have moderate pliability, to avoid damaging products; the whole transmission part can be moved back and forth, press evenly, convey products in order which ensure perfect finished-product quality. 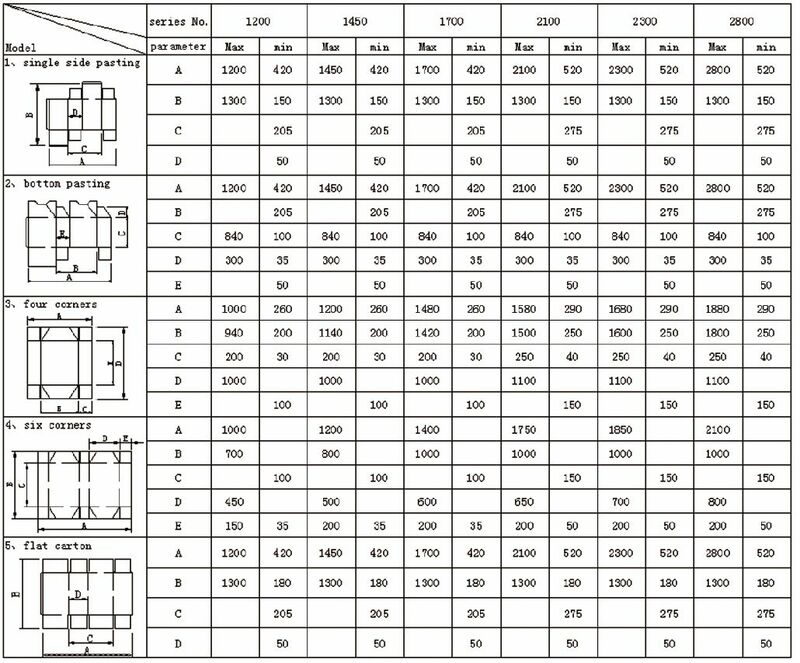 Transmission part speed is automatically adjusted according to running speed of main machine as well as phototube. Also manually operate and speed are optional; functional devices are consisted of rubber wheels.